Republican presidential candidate Newt Gingrich said on Florida's space coast that if he is elected president he will create a moon colony by 2020. COCOA, Fla. -- Newt Gingrich promised Wednesday on Florida’s space coast to create a moon colony by 2020 if elected president. "By the end of my second term, we will have the first permanent base on the moon. And it will be American," Gingrich told the crowd of roughly 700, taking them to their feet in applause. The former House speaker said the current space program in the country is a "tragedy" and believes his "grandiose" ideas can help fix it. "I am sick of being told we have to be timid and I'm sick of being told we have to be limited to technologies that are 50 years old," he said, noting that by 2020 he wants to be capable to go to Mars. Former Massachusetts Gov. Mitt Romney seemed to question Gingrich’s desire to put lunar mining colonies on the moon during a debate last month but the speaker says these are bold ideas the governor doesn’t understand. "I was attacked the other night for being grandiose. I would just want you to note: Lincoln standing at Council Bluffs was grandiose. The Wright Brothers standing at Kitty Hawk were grandiose. John F. Kennedy was grandiose. I accept the charge that I am grandiose and that Americans are instinctively grandiose," Gingrich said. Republican presidential hopeful Newt Gingrich, center, speaks at a Space Coast-Space Industry roundtable Wednesday at Brevard Commnunity College in Cocoa, Fla. Speaking about space is not new for Gingrich. In stump speeches, he often references his ideas to change the struggling American program, but this was the first event he completely dedicated to the topic, hoping this is "the second great launch of the adventure John F. Kennedy started." "At one point early in my career I introduced the northwest ordinance for space and I said when we got -- I think the number is 13,000 -- when we have 13,000 Americans living on the moon they can petition to become a state," Gingrich said, telling the crowd this was the "weirdest" thing he has ever done. 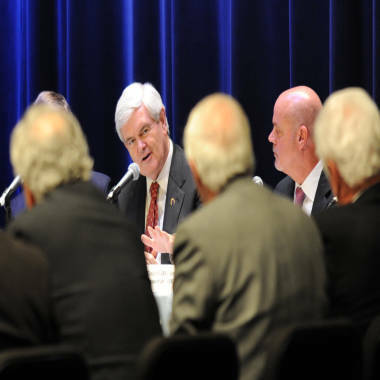 "And I will as president encourage the introduction of the northwest ordinance for space to put a marker down that we want Americans to think boldly about the future…"
Gingrich finished off his public schedule for the day with a Space Industry Roundtable at Brevard Community College.